This is a return to our original Trash The Dress Session with our lovely Model Jessie. This was after several hours rolling around in a Park in Poway, California, in the the, rain, muck and mire, What a trooper she was. The reason to again examine these images was due to a course we recently took by Master Photographer, Ben Chen. He explained his techniques and setups for on location lighting. Directional off camera flash is a preferred and wonderful method, and I feel this could have brought a bit more drama to this shot. This was with on camera flash (you can tell immediately by the catch lights in her eyes) with a diffuser. This is called flat lighting and while not quite an effective as a large soft box at 45 degrees, it didn’t turn out too shabby. One of the great things about shooting young people is that you can get away with almost anything – don’t have to worry too much about wrinkles and other flaws so much. This is all part of the process of honing our skills as on location photographers. Sometimes small adjustments can make a huge impact. Le Rêve, or The Dream from French, seemed appropriate for this magical, dreamy afternoon. Clearly from the ring-on-finger, this was a post engagement shot where everyone could take a deep breath and relax a bit before getting excited all over again as to what exactly happened just a few moments ago. We brought this exquisite Cali Sparkling Wine which we had been saving for a truly special occasion – what could be more special? Le Rêve, is a luxury Blanc de Blancs cuvee originally inspired by Taittinger’s Comtes de Champagne. Blanc de Blancs means “white of whites” or white wine made from white grapes. Eileen Crane and Claude Taittinger believe that the finest sparkling wine in the world is Blanc de Blancs made from Chardonnay grapes. These wines have greater finesse and ageability and Le Rêve is no exception. 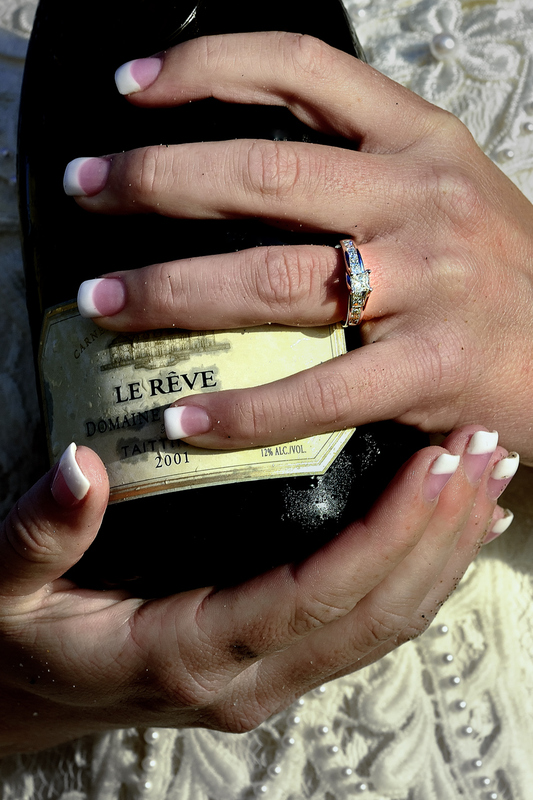 The Le Rêve Blanc de Blancs is generally 100% Chardonnay (with a small percent of Pinot Blanc in some years). Aged a full 6 years prior to release, Le Rêve drinks beautifully upon release and continues to develop for years in the cellar. We love to shoot Trash the Dress sessions, especially on the beach! Trash the dress, also known as fearless bridal or rock the frock, is a style of wedding photography that contrasts elegant clothing with an environment in which it is out-of-place. It is generally shot in the style of fashion and glamour photography. “Trash the dress” is the art of destruction or deconstruction of a brides wedding dress to create a new artwork that the bride would be proud to display on their wall. This session, in San Clemente came with a bit of a twist – it was a surprise Engagement! Mark had been planning something for quite a long time but was stumped as to the actual execution. He had purchased the ring and was writing countless speeches, composing songs and generally getting somewhat anxious. Kathleen mentioned to Jessie that we were entering a Photo Contest and needed some Beach shots with her old wedding dress! Hair, makeup and the works followed and Jessie followed our script (Mark kept his cool) until around 30 minutes into the shoot. When Mark posed the question (not that we could hear due to the incredible surf), she gave a “Shut Up!” look when she realized that this was just not another Photo Shoot! Priceless! This was taken towards the end of the Trash the Dress shoot with our lovely model Jessie. She had already been up against a train box car, sitting in dirt, crawling on wet grass…and there was an intermittent pouring rain all afternoon. What a Trooper! This fast bike was our last prop, and she looked like she just wanted to fire it up and get the heck out of Dodge! We all had so much fun! This is another shot from our Old Poway Park “Trash The Dress” series. Trash the Dress, also known as Fearless Bridal or Rock the Frock, is a style of wedding photography that contrasts elegant clothing with an environment in which it is out of place. It is generally shot in the style of fasion and glamor photography. Usually brides decide to have pictures taken on a beach, but other locations include city streets, rooftops, garbage dumps, fields, and abandoned buildings. …we do have many Non-Fierce pictures of our stunning model Jessie in case you were wondering!